Stuffed Paratha Machine and Equipment - ANKO High Efficiency Stuffed Paratha Production Equipment Design | ANKO FOOD MACHINE CO., LTD.
To produce stuffed paratha and other stuffed pastries in restaurants or central kitchens, we suggest ANKO's SD-97 Series of Automatic Encrusting and Filling Machines; clients can evaluate and base their expected productivity, special requests and available space for the production line, and choose from ANKO's SD-97SS Table Type Model, which is compact in size; SD-97W model, which is slightly larger, but has the capacity of producing up to 4,200pc/hr, it's also engineered with 5 programmable memories and can work with both dry and wet fillings. Or the SD-97L Model, which is specially designed with a larger product size range, it can produce final products ranging from 40g to 200g/pc, and has the maximum capacity of 4,800pc/hr. 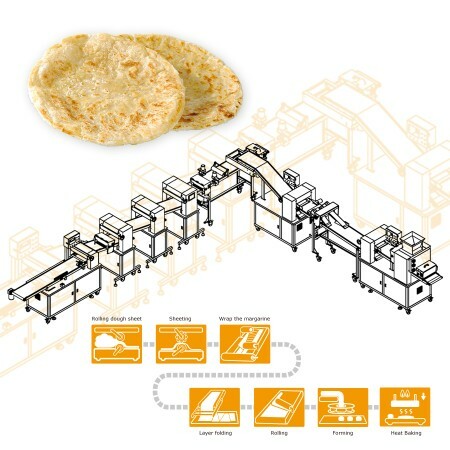 And for larger food plants or factories, we recommend ANKO's LP-3001 Automatic Layer & Stuffed Paratha Production Line. This is specially designed to produce stuffed paratha and many other stuffed pastries. The process starts from folding butter into dough, through several times of fold and press to create puff pastry, then it automatically stuffs the pastry. With an EA-100KA Forming Machine attached, it's able to form products from 15-150g in size. 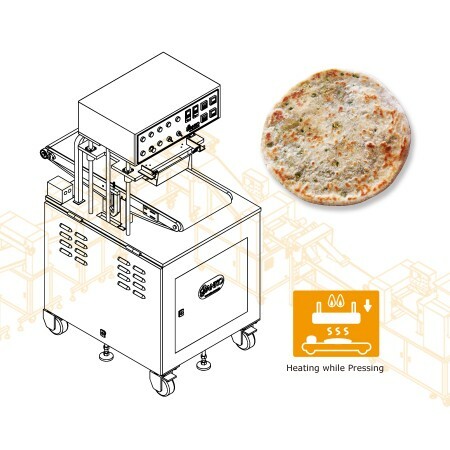 The production line could be further completed by attaching the PP-2 Automatic Filming and Pressing Machine to flatten the pastries between 2 thin films and ready for packaging; or pastries can go through the APB Pressing and Heating Machine to cook. This production line has the capacity of producing from 1,500pcs/hr up to 3,500pc/hr. Paratha is a type of flatbread; the name derives from the Hindi word “parat” meaning layers and “atta” which means dough. It originated in the north of the wheat-growing region in the northern part of India, and it still remains an important staple food item. Parathas are also known as parantha, parontay, porota in different regions, or farata in Sri Lanka and the Maldives. These flatbreads are usually made with unleavened dough and fold in ghee (purified butter) to create the layers, then cooked on a tava (a type of flat, concave or convex metal wok/cooking pan) till light and fluffy. Paratha could be made plain or stuffed with various ingredients such as meats, eggs, vegetables, cheeses or even sugar and sweet fillings as desserts. 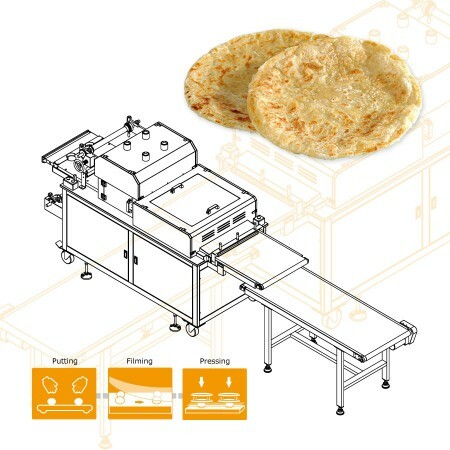 The machines listed below are designed for making Stuffed Paratha. Please feel free to contact us via the form below. We will happy to answer any questions you may have regarding our products, services, and turnkey projects. Film products by upper and bottom sides. PP-2 will press products to required diameter and thickness, and then divide each products. After dividing, products will be stacked for packaging automatically. PP-2 is suitable for Lacha paratha, Paratha, Roti, Chinese pancake, etc.